UK wholesaler Fields, Morris & Verdin held its first dedicated tasting featuring its North American portfolio recently, highlighting the quality and value of the wines as well as a host of new arrivals as the market for US wines continues to grow. Dubbed the ‘West Coast Road Trip’, the tasting covered the company’s portfolio of some 18 producers ‘from Santa Barbara to Seattle’ including classic producers such as Qupé, Ridge and Frog’s Leap and newer additions including Bedrock Wine Co., Fog Monster, DeSante and El Molino. Speaking to the drinks business, North American buyer Fiona Hayes explained that while FMV has traditionally carried a good number of North American wines, “[we’ve] never shouted about it”. With the popularity of American wines growing in the UK, however, helped along by a new wave of producers and both a return to but also growing awareness of the less bombastic side of American winemaking, “we felt it was time to showcase the talents of these winemakers. Somewhat stigmatised (however rightly or wrongly) for being dominated by jammy, oaky, highly alcoholic, ‘cult’ and hugely expensive wines, the sort of wines now emanating from the US chime much better with UK palates, helped along by a growing number of customers happy to include more New World fine wines in their cellars. “The younger generation is not chasing points, they’re producing great glasses of wine where all is in balance,” said Hayes. Some of the newer wines presented at the tasting involved some of the growing number of Burgundian collaborations with US partners such as Lingua Franca (co-founded by Larry Stone, David Honig and Dominique Lafon) and Nicolas Jay (Jean-Nicolas Méo and Jay Boberg) which are predominantly Pinot and Chardonnay affairs. 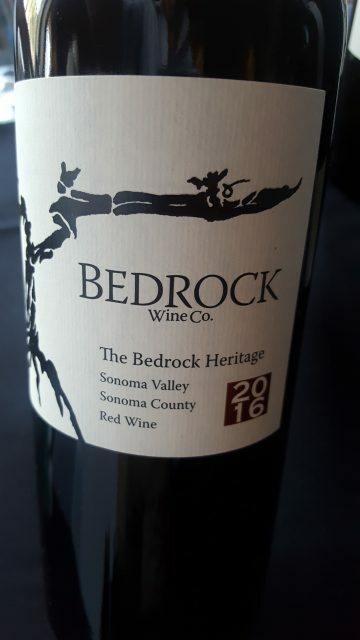 There were also more ‘home grown’ efforts too such as Bedrock, which is run by Ravenswood creator Joel Peterson’s son, Morgan Twain-Peterson MW, and which uses old Sonoman bush vines planted in the late 19th century to create predominantly Zinfandel-based, single vineyard field blends that sometimes include over 20 varieties.